Last Saturday evening, my daughter and I took in a show over at Studio East of Kirkland. It was the opening weekend of their two weekend production of Sondheim’s dark musical “Sweeney Todd – The Demon Barber of Fleet Street”. Clearly, this is not your average musical. Who else but Sondheim could envision a marriage between song and culinary cannibalism? Lovers of “The Sound of Music” be forewarned, “Sweeney Todd” it is not recommended for children under 13 years of age due to some mature content. There will be no ‘Edelweiss’ in this production unless it is being used to spicy up Mrs. Lovett’s special ingredient meat pies. Awaiting the beginning of the performance, I found myself anxious and full of trepidation. Not only does “Sweeney Todd” deal with a multitude of disturbing and adult concepts, but it portrays the world of London as an inhabitation of characters driven by their most base human desires. It is a dark world, where injustice and moral corruption reigns. I wondered if a cast of young adults and children, some as young as ten years of age, could truly bring that world to life? Could they convey and manifest upon the stage, the desperate conflict of good and evil within each one of us and yet still inspire and entertain the audience? The answer for the most part is a resounding yes. Studio East does a solid job of bringing the dark world of “Sweeney Todd” played by the capable Christian Obert, to life but also in offering us some hope. Obert shows that he is equally at home playing a morose, tormented lead character like Sweeney Todd as he is playing humorous supporting characters like Rapunzel’s Prince (Into the Woods) or Mr. Trevor Graydon (Thoroughly Modern Millie). Todd, to his inevitable detriment, is so driven by hatred for those which have wronged him that he can see nothing else. Love and happiness are unrecognizable strangers to Todd, having been replaced with a single-minded focus for revenge on those who have hurt him. Obert does an admirable job in conveying this obsession. 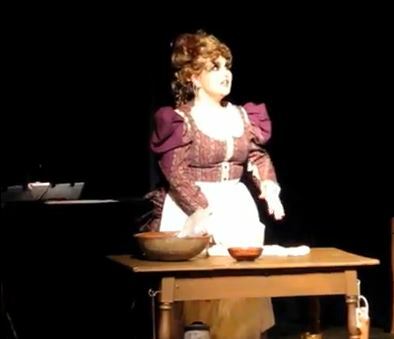 Syd Coan as Mrs. Lovett, Sweeney Todd @ Studio East 2013. The show is a dark comedy and as such there is a danger of allowing the strong yet sullen Sweeney Todd, so consumed with his own introspective struggle, to drag the show down. Theater is partially about allowing the audience to escape from their own mundane lives; so audiences even when watching plays with vile elements, still look for reasons to laugh. There must be a balance to the haunted and sober Todd. There must be an even stronger more gregarious character for the audience to connect with and laugh. Enter the remarkable and vivacious Syd Coan whose inspired performance of Mrs. Lovett keeps the audience in stitches, infusing the show with needed energy from beginning to end. Coan’s beautiful voice, delightful accent and stage presence beyond her years, mesmerized the audience. It is clear that she is having fun and relishing her role as the morally compromised yet snarky and lovable Mrs. Lovett. Though flawed like Todd, she is unfettered and unrestrained, freely verbalizing her thoughts and desires in a way that Todd cannot. Together, Coan and Obert generate an onstage chemistry which works. Their rendition of “A Little Priest” was fun and wonderful. 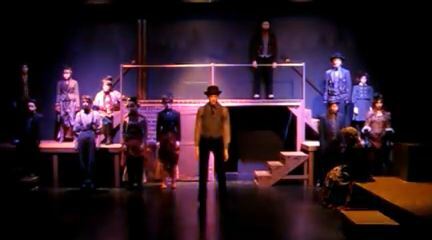 The show opens in dark shadows with a stunningly costumed cast, singing stone-faced the “Ballad of Sweeney Todd”. Everything was so well done, that it gave me chills. In the seedy world of London, we are introduced to other unsavory characters, like the suave but twisted Judge Turpin played convincingly by Cameron Riggins. Riggins’ duet with Obert on “Pretty Women” was chilling. Next to Judge Turpin is his slick and despicable enforcer, Beadle, adeptly played by Erik Abramson. We are then introduced to the flamboyant snake oil salesman, Pirelli, hocking “piss smelling” hair growth tonic to the Londoners. 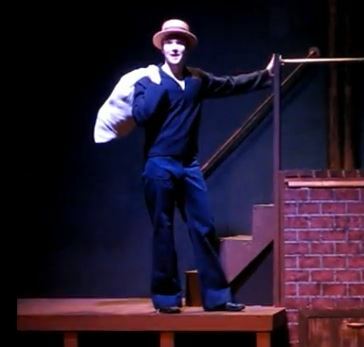 Thomas Kehoe takes delight in playing the role of the quirky shyster. Sonja Usher, perhaps best known as Mrs. Meers (Thoroughly Modern Millie) has a strong performance as the Beggar Woman. I still can remember her warning, City on Fire, perhaps as memorable as her ‘so sad to be all alone in the world’ from Millie. I also wanted to call out Savannah Brady’s gifted vocals among a strong and talented ensemble. Christian Pflager as Anthony Sweeney Todd @ Studio East 2013. I mentioned that even among the corrupt and base denizens of London, there are a few beacons of virtue to be discovered and therefore there are reasons to remain hopeful. In fact there is a trinity of virtuous characters. The first, such beacon of hope and virtue is Anthony, played convincingly by Christian Pflagler. Pflagler does a tremendous job of balancing out Todd’s gloomy disposition with his own virtuous take on life. His rendition of “Johanna” and duet of “Kiss Me” with our second beacon of hope in the play, Johanna (Elisabeth Williams), were touching and sincere. This trinity of hope is completed with the child, Tobias and expressed in his sacrificial protective love for Mrs. Lovett. Erich Schleck’s portrayal of Tobias is believable, honest and endearing, culminating in a touching “Not While I’m Around”. The good news is that Studio East delivers the goods with their production of Sweeney Todd. The bad news is that this weekend is the last opportunity to enjoy the best ‘meat’ pies in London over at Studio East in Kirkland.